Sony grows its memory card series with the introduction of the ultrafast G Series CFast 2.0 cards, which join the company’s line of SSD, XQD and SxS memory solutions. Designed to meet the demands of photographers and videographers shooting high-capacity DSLRs and 4K cinema cameras, the 32 GB, 64 GB and 128 GB cards feature a write speed of up to 510 MB/s and a read speed of up to 530 MB/s. Additionally, the G Series CFast 2.0 cards support the VPG130 standard for recording high-bit-rate 4K video. Sony guarantees a minimum sustained write speed of 130 MB/s here. Sony notes that the cards are highly durable and resistant to static. Having passed a battery of drop, vibration and shock testing, they’re designed to work across a wide range of weather conditions and temperatures. Sony File Rescue software allows for the recovery of accidentally deleted photo and video files. The cards also come with a hard case. Scheduled for early 2018 availability, the G Series CFast 2.0 cards are priced at $119.99 (32 GB), $199.99 (64 GB) and $349.99 (128 GB). Get more information at www.sony.com/electronics/xqd-memory-cards/g-series-cfast-2.0-memory-card or check out the Sony blog. 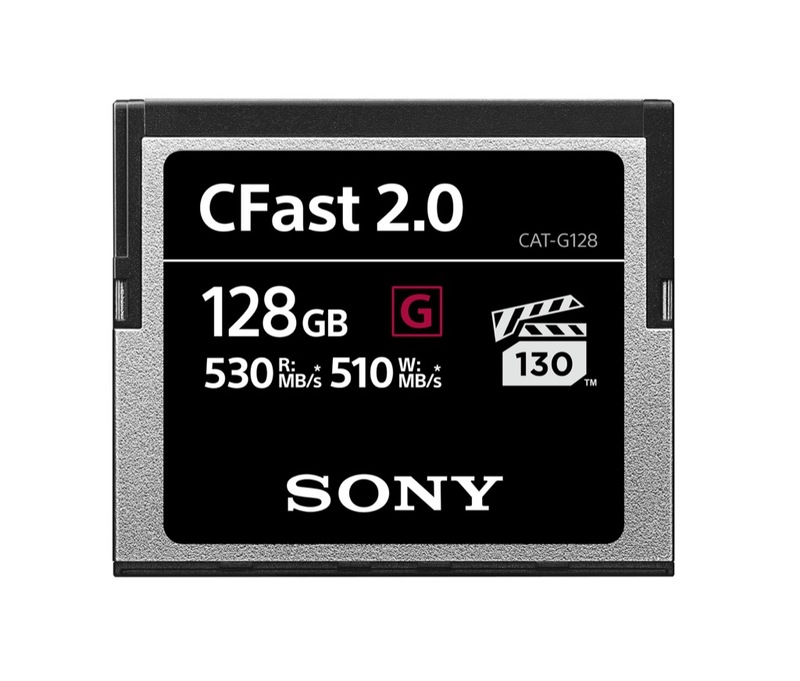 Sony’s G Series CFast cards are planned to be available in early 2018 for a suggested retail price of $119.99 for 32GB, $199.99 for 64GB and $349.99 for 128GB. For more information, please visit: www.sony.com/electronics/xqd-memory-cards/g-series-cfast-2.0-memory-card.